Fall is an excellent time in many areas to bike to work. It’s not too hot, not too cold -- just right for biking. But how do you actually go about doing it? You could just head out the door and make your way to work like any other day, but we think you’ll have a better time if you do a little planning. Bikes are not cars. Don’t assume that the route you use in your car is the best one for biking. Many cities have bike maps published by either the local city government or a bicycle advocacy group. Pick up a map at your local shop or find it online (Google “Atlanta Bike Route Map” and you get the A-Train.) 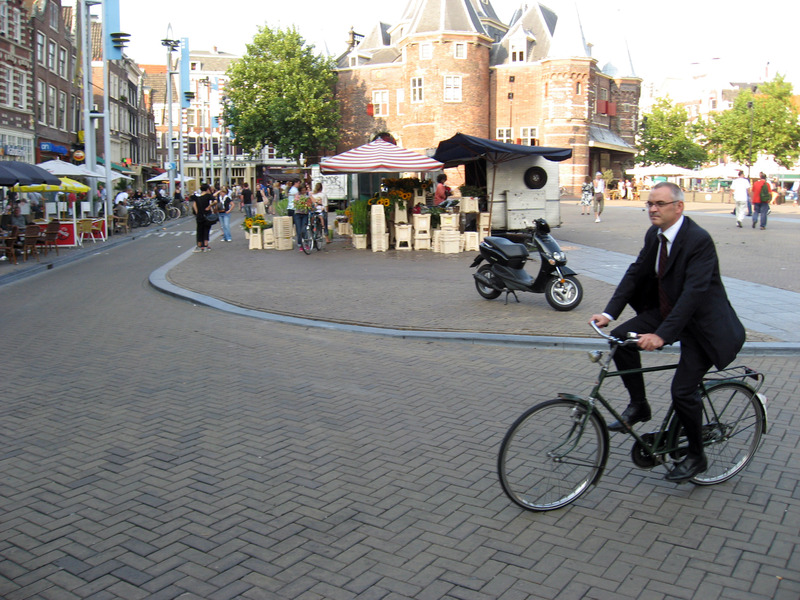 Now, create a route using the most direct streets with bike lanes and bike paths, if they exist. If you live in a city with a lot of hills, take them into consideration. Going a little out of your way might be worth it to keep away from monster climbs. There are great bike route maps for San Francisco and other cities that allow you to enter the maximum incline you want to climb. Your first day is your second day. Now that you have a route figured out, try it out on a weekend instead of on Monday morning. That way you can time it so you show up to work relaxed and on time Monday morning. Just remember that there will be more traffic on a weekday, though bike riders rarely get stuck in traffic (another big perk!). What to wear. If you live close to work, you can wear your work clothes when on your bike. Don’t think it’s possible? People in Amsterdam do it every day! If you live far enough away that you are really working hard, wearing cycling clothes or whatever you feel comfortable in. Make sure you&apos;re warm enough; consider several layers.Then bring a change of clothes. And wear a helmet. Packing for work—part-timer. If you are only biking one or two days a week, consider bringing in a bag with the next day’s work clothes when you drive, so you don’t have to carry them with you on your bike. And if you like to bring your own snacks and lunches, make sure to bring extras on your driving day. Packing for work—full-timer. Make sure you have a backpack that can hold all of your clothes and is also comfortable to bike with. If you have racks on your bike, that’s even easier. Your bag should be waterproof so your clothes stay dry. If you are bringing leftovers with you, put your Tupperware in a reused plastic bag so it doesn’t spill. Parking. You’ll want to find a good place to park your bike near your office before you bike to work. Does your office have a bike room? If not, is there a good spot to lock it up nearby? Try to keep your bike out of the weather, and make sure to lock up both the frame and the wheels. Cleaning up. This is a big one, and one that scares a lot of people off. It’s pretty easy to bike to work and smell good when you get there! Some offices offer showers for workers. That’s excellent. If you don’t have one where you work, check to see if there are any gyms nearby. Gyms will often let you use their showers for a reasonable rate. If your ride is short, or you don’t work up a sweat, you can always wipe yourself with a moist paper towel or wet wipes to freshen up. Environmental Dilemma-Real or Fake Christmas Tree? Should I Put Solar Panels on My Home?